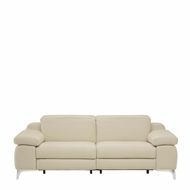 The DUCA reclining sofa, designed by NATUZZI ITALIA and made in Italy, is an impressive, accurately crafted sofa, whose superior comfort is apparent at first glance. Details that make it particularly comfortable include wide armrests, generous seats and adjustable headrest. 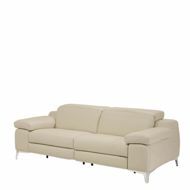 Designed and manufactured with the utmost care, the sofa features handcrafted stitching on the sides and cushions, and is perfect from any angle also when positioned in the middle of a room. 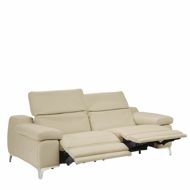 This version of DUCA not only features electric 'motion' features to allow for optimal comfort but it even features an audio system built into the sofa itself! The dimensions do change depending on the position of the sofa's motion feature.